The new 2019 BMW 3 Series is finally here, and not only does it look good, but it’s got more power, more space, more technology, and more of pretty much everything else—except weight. Here’s what you need to know. First things first: the car looks good in person. We saw the first images of it yesterday, and some readers were a bit concerned about the front end looking a bit “busy.” In person, I didn’t think that was the case; this new 3—codenamed G20—is a pleasant, but not overly dramatic evolution of the outgoing car. With that out of the way, let’s look at the changes over the outgoing model. The two cars available at launch in the U.S. are the 330i and 340i, as well as all-wheel drive “xDrive” versions of each. There’s no mention of a lower trim, and in fact, a BMW spokesperson told me via email that the basic trims offered in Europe—cars like the 318i and such—would not be coming stateside. The High Precision Injection system ensures precise fuel metering and particularly clean combustion, its new fuel pump generating maximum pressure of 350 bar compared with the 200 bar of the previous version. The improved direct injection system enables optimal fuel flow through the combustion chambers with atomized fuel delivered by multi-hole injectors. BMW also mentions a lighter crankshaft, reduced engine friction, and “optimized heat management” (though the release doesn’t go into detail on what that means), and a new engine management system. The six-cylinder model, the BMW M340i, makes 382 horsepower and 369 lb-ft of torque from a new version of the straight-six engine found in the outgoing 340i. It got a nice boost of more than 60 horses this time around. Both of the 2019 car’s aforementioned new engines get bolted to ZF eight-speed Sport Steptronic automatics, which feature launch control as standard. This “latest upgrade” to the company’s sport automatic transmission, BMW claims, is more efficient, shifts faster, and has shorter low gears for quicker acceleration. Like the transmission in the 7 Series and in other BMW-group cars, this gearbox uses the optional GPS system and the car’s radar system to control shifts to “avoid unnecessary gear changes when negotiating a series of fast corners,” as well as to downshift early to use engine braking to strategically slow down. Similarly, the car’s stop/start system uses camera information to decide whether it’s worth shutting the car down, or if the stop is just a brief one at a stop sign or roundabout. BMW says the two powertrains will yield 0-60 mph times of 5.3 to 5.6 seconds on the 330i xDrive and 330i models, respectively. The M340i, the company says, will do that sprint in roughly 4.2 seconds. Yes, the all-wheel drive 330i model is quicker. Speaking of which, BMW says the system has been updated, and—with its fully variable transfer case that can quickly adapt to reduce oversteer and understeer—that it is better able to split torque between the front and rear axles than the outgoing car. The setup is also apparently lighter, and—thanks to some changes in the lubrication methodology—apparently more efficient overall. The new 3 Series has a larger track width front and rear, 50:50 weight distribution (as before), and is up to 121 pounds lighter compared to its similarly equipped predecessor. That latter stat, BMW says, is in part a product of a 44 pound lighter body-in-white, as well as an aluminum hood and aluminum front fenders. It’s worth mentioning that the new 2019 330i’s 3,582 curb weight is actually more than what BMW has listed on its media site for the 2018 automatic 330i: 3,541. The same holds true for the xDrive variants: 3,764 vs 3,706. I’ve asked BMW why this is the case, and the company hasn’t yet responded; I’d guess it has to do with the qualifier “similarly equipped.” The new car probably comes standard with more features, but remains lighter overall. In addition, BMW says the front wheels have more camber, and that the car’s body structure itself is much more rigid: 25 percent stiffer globally, and 50 percent stiffer locally, to be exact. This, the Bavarian automaker claims, allowed for the spring rates to go up 20 percent without reducing driving comfort. On top of that, the company says the unsprung mass is down thanks to significant use of aluminum in the front suspension. On top of that, there are new “lift-related” dampers, which are standard on all models. These dampers, which vary their response based on stroke, are said to reduce body motion in turns, and improve ride quality. For the rear suspension, the setup is essentially a damper within a damper, the smaller piston of which only enters its cylinder when the rear suspension of the car is compression, providing additional damping forces when needed. The front has a similar setup, except the inner piston only enters its cylinder when the front suspension is in rebound to prevent the front wheel from lifting (this would be bad for handling). Aero changes—as well as additional foam in the pillars—are said to reduced the wind noise heard inside the car when compared to the predecessor. But of course, a drag coefficient is nothing without knowing the car’s frontal area, and while BMW doesn’t have it listed, the car overall has grown. It’s now 2.9 inches longer, 0.6 inches wider, and half an inch taller. The wheelbase is also up 1.6 inches, and the track widths are up 1.7 inches up front and 0.8 inches in the back. This all results in more rear legroom, more shoulder room up front, and more headroom for all passengers, BMW says. The interior is different, but not too different. There’s a new digital instrument cluster and infotainment screen. At first glance there definitely seem to be some material improvements over the old car. It’s luxurious, without being as opulent as, say, a 7 Series. The 330i is hitting the U.S. market in March, starting at $40,250 plus destination; the all-wheel drive model adds $2,000. These pricing figures are similar to those of the current 330i and 330i xDrive. 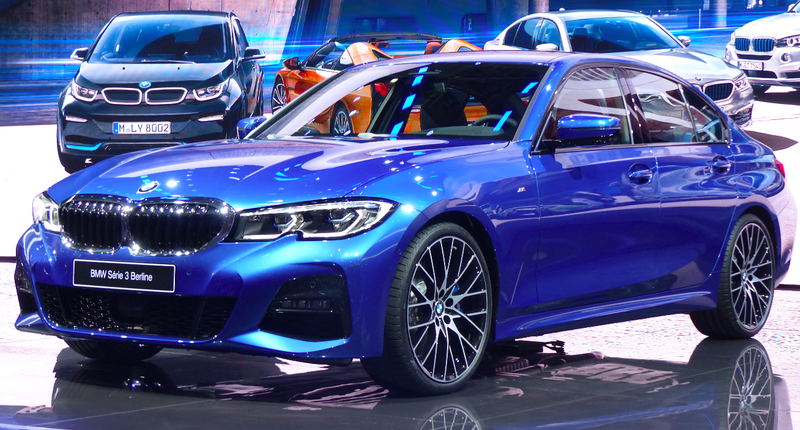 There’s no word on pricing for the M340i, nor is there much info on two other variants that BMW mentions in the press release: a 330e iPerformance plug-in model planned for 2020 and the forthcoming M3. Anyway, it seems promising. Even with SUVs driving demand more than ever, the 3 Series is still BMW’s bread and butter. We’ll see if it’s still the sport sedan benchmark when we get behind the wheel.